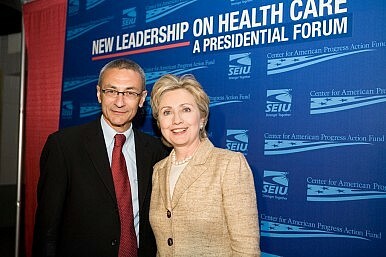 John Podesta with Hillary Clinton in 2007. This week, several media outlets reported that Myanmar had hired the Podesta Group, a powerful US lobbying firm, to represent its interests in Washington. Connections between governments and other influential actors in Washington are far from unique to Myanmar. And speculations about links between the Myanmar government and the Podesta Group – a firm founded by Tony and John Podesta, with the latter serving as chief of staff to President Bill Clinton, senior adviser to President Barack Obama, and now campaign chairman for Hillary Clinton’s 2016 presidential run – have been circulating for a while now. Last May, the connection made headlines when officials from the firm attended a meeting in the Rakhine State capital of Sittwe. But the recent wave of attention largely stems from the April 10 disclosure filed by the Podesta Group with the Justice Department saying the firm will be paid $840,000 a year. The ‘activities’ the firm will perform are described in the disclosure as providing “strategic counsel to the principal on strengthening the principal’s ties to the United States government and institutions,” as well as to “assist in communicating priority issues in the United States-Myanmar bilateral relationship to relevant U.S audiences, including the U.S. Congress, executive branch, media, and policy community.” The Hill reports that this is the first time Myanmar has hired lobbyists in Washington for more than a decade. The securing of these services comes as the United States continues to assess how far it can go in its evolving relationship with Naypyidaw, with the country’s historic opening in 2010 and ongoing rapprochement with Washington in peril with stalled reforms ahead of crucial elections later this year. Some – including in the US Congress – remain concerned about the country’s future direction, with critical constitutional reforms being unrealized and lingering problems including those related to ethnic conflict, intercommunal violence and human rights. Some lawmakers have argued that the Obama administration has done too much too soon, and have called for a suspension of further US ‘concessions’ and even restrictions on the regime in Naypyidaw. Priscilla Clapp, the former U.S. Charge d’Affaires and Chief of Mission in Myanmar from 1999 to 2002, told The Hill that the country’s link with the Podesta Group was not surprising given its troubled transition and need to better navigate the American political system. Some will undoubtedly view the link between Myanmar and US lobbyists as a way for Naypyidaw to deflect efforts at reform at home by shaping the narrative abroad. “Rather than really reforming, Burma will pay Washington lobbyist $840K/year to pretend it is,” Kenneth Roth, the executive director of Human Rights Watch, tweeted on April 15. An old worry is being expressed with a renewed sense of urgency.